This is a view looking south down Borrowdale from near the Bowder Stone towards Rosthwaite. In the foreground is the river Derwent with the summit of Glaramara in the distance. 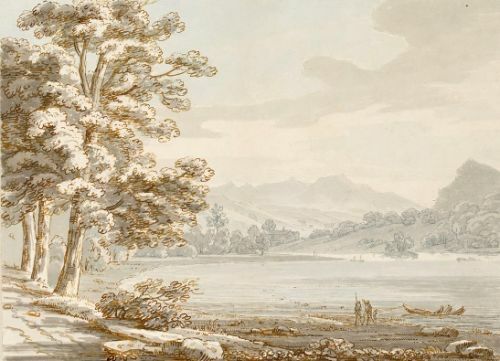 Constable drew a similar view on his tour of the Lake District in 1806 ? ?View of the Borrowdale towards Glaramara?, Victoria and Albert Museum (see Hebron, Shields and Wilcox, The Solitude of Mountains ? Constable and the Lake District, 2006, p.136, no.64, ill.). Sunderland was born at Whittington Hall near Kirkby Lonsdale, Cumberland and ran the family business of iron mining until 1784 when he retired to Little Croft, his large house in Ulverston. 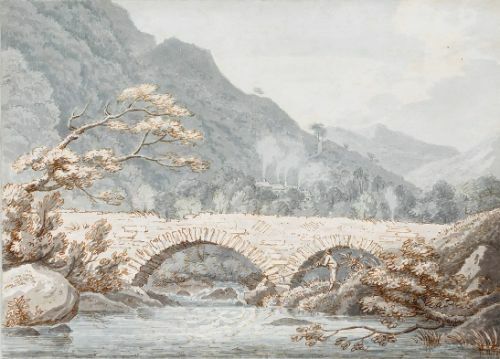 He devoted the rest of his life to local affairs and to drawing the scenery of the Lake District. 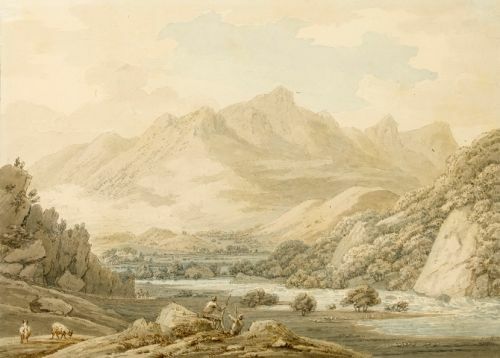 A view of the Bowder Stone in Borrowdale by Sunderland, on the same sized sheet is in the collection of the Wordsworth Trust, Grasmere (see Stephen Hebron, In the Line of Beauty ? 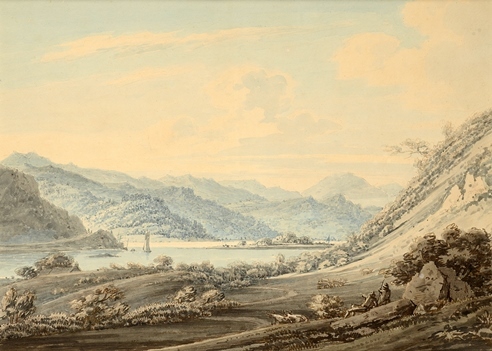 Early views of the Lake District by Amateur Artists, 2008, p.82, no.54, ill.). 32.5 by 45.4 cm., 12 ¾ by 17 ¾ in. This is a view of Ullswater from the east bank looking across to Stybarrow Crag. Sunderland was born at Whittington Hall near Kirkby Lonsdale. He successfully ran the family business of iron mining and smelting until retiring to a house at Ulverston in the early 1780s. Sunderland was a regular visitor to Ullswater as his daughter Anne was married to the Rev. Henry Askew who lived at Glenridding House on the lake.